Kelly's Korner: Show Us Your Life - What do you Make? Show Us Your Life - What do you Make? PLEASE NOTE: Please don't include any home based businesses such as Avon, Mary Kay, Pampered Chef, etc..... Those are all wonderful things but this is a carnival for homemade items. All others will be removed. Thanks!!!! P.S. This post will stay active on www.kellyskornershowusyourlife.blogspot.com so go back and refer to it at anytime. I'll have it there next week. Kelly - Thanks for giving us this opportunity! It's greatly appreciated. Thank you so much for this opportunity to showcase our Etsy store. We are using our Etsy store to help fund our Ethiopian adoption. Great choice for "show us your life". Can't wait to start shopping! Thanks Kelly so much for letting us showcase the things we make!! Love your blog. I have four kids and today I was getting a little fustrated at small things and then I thought about your post earlier about all the women who have lost or are waitng for a child. It made me let go of those things that was bothering me and be thankful that I have my kids!! Thanks for reminding me!! I pray for those you have lost a child that God would hear thier hearts and that God would bless those waitng for a baby!! Oops...don't know what happened above. Anyways...thanks again for your kind email the other day. I appreciate you so much for letting me know about this! I still want to create a STAMPS artwork for your family. Fun, I hope I find some Christmas gifts! Great Idea Kelly! Thanks for doing this. Awesome post!!! I'm a total mom-consumer. I will have to do a post about my favorite mom's who make stuff. YAYYY I'm so glad your doing this!!! I just posted mine and will be sifting through the others soon! I am so sorry! I put up my blog really quickly because I was so excited to have some views of the jewelry I am selling. However, I just read that it has to be a hand made item. Mine is NOT handmade, BUT I don't know how to delete my link. By the way, I so love reading about Harper on a regular basis. She is exactly 6 months older than Ava, so I can look forward to what Ava will be doing in 1/2 a year........but not wishing these early months away, as she is oh so SWEET!!! This is a great idea...thanks for hosting it! I'm going to spend all weekend looking through these wonderful websites! I am loving looking at all these creative things. Such cute clothes and artwork. Thanks for hosting this. Thanks so much for hosting this blog hop. Our etsy shop is fairly new. We are hosting a giveaway for a set of hand knit dishcloths from our shop. Drawing will be held Oct. 22. Thanks again! Kelly, thank you so much for the wonderful *free* advertising! I would also love to send you some freebies for being so kind. Feel free to check out my store and let me know your 3 favorite things and I'll get them sent to you next week. I'm also offering your blog readers 20% off in my Etsy store. Thanks for the opportunity to share my products. Thanks so much for helping share the love to us work at home moms. Etsy is ADDICTING isn't it?!?! Me too Kelly! I just ADORE Etsy! Thank you hosting this event. I just know I will find something new to buy. Such a great Show Us Your Life topic! It may get me in trouble, though! Kelly - thanks so much for this fun theme! Looking forward to going through the links! Thank you so very much Kelly for allowing us this opportunity! There is so much talent out there!!! So far my fave item are the spoon rings! Great idea! Can't wait to see all the fun shops! Thanks so much for giving us the opportunity to showcase our handiwork and for giving us so many new places to shop!!! I can bake a mean batch of chocolate chip cookies, banana bread...so I guess instead of a maker, I am a baker...hehe! What a lovely idea! Thanks for hosting this! My wife Sandra reads your blog daily and suggested I submit my portrait drawing website for your links. Thank you! Your the best Kelly! Thanks for posting this topic in "show us your life!" I'm excited and can't wait to browse all the sites for my sweet baby girl! Seriously, how am I going to get through all of these!! HA HA! I love it. I know this will be expensive, but with Christmas just around the corner. I found your link through another friend of mine, so I have been lurking and reading for the past few months. Wow, I know what I'll be doing this weekend, going through all of these linkups. Thanks for posting and allowing us moms to advertise what we do and believe in. I want to send you a little thank you from my store, if you'll just shoot me an email of where I can send it I'll get it out to you. What a fun idea. I'd love to add my business to the list! I sew for children, but lots of my clothes have purple and gold! I found your blog through Chrissie Grace--only to discover that you must have gone to Ouachita too! I finished in 97. Have we meet? Thank you so much for doing a "show us your life" about handmade businesses. My life is all about my handmade business of making unique paper designs for parties and weddings. I really appreciate your recognition of other artists like myself. It mean so much to me! Hands down this has been my favorite "Show us your life". I'm making my Christmas list & checking it twice! Thanks so much for this list! I'm finding so many great things to buy! I love all your blogs! Thanks for sharing! This is my favorite Friday yet! Love all of the fresh ideas and the opportunity to support other women buy purchasing homemade items! Thanks for giving us the chance to do this! Thanks for giving us this opportunity, Kelly! I am raising money for my blog friend's adoption, so the timing was perfect on being able to get more exposure. I love Mommy-owned businesses too and I can't wait to go see what cute things everyone makes!! Hey Kelly! Just wanted to say thanks for doing this fun little blog hop. There is just something special about Mommy owned businesses and all the love that goes into hand made things. I am so excited to be able to meet other mommies who make things! Thanks for hosting this wonderful opportunity for us to showcase our goodies! It's fun to see whatever one else is making and I've already gotten some great sites for my Holiday shopping. Kelly, it is so awesome that you did this! Could I offer you a fun little thing that you could do on your site so that we can take a peek at the websites listed, Snap Shot is way cool! (No, I am not from Snap Shot..lol...but I use it on my blogs and website and I love it! I know that I would love to peek at all of the websites but might not have time to click on all 300+, it is free and if you click on my name and go to the OC Boutique Vendors blog of mine, you will be able to see it in use! Just a thought, I love love love your blog and little Harper is a blessing and just adorable! I am truly honored that I have been able to find you and read about your life! This is such a great idea! Thanks for posting this. I would post my shop, but it is in vacation mode until January since my baby is due in a couple of weeks. Will you be doing something like this again? 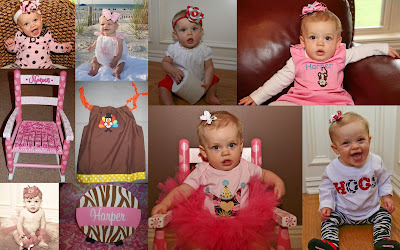 Can you possibly do a "Show me your childs first birthday party pictures with their theme and ideas". My son's 1st brithday is in December and I have no clue what theme to do!! Thanks for posting this! I have already bought from 4 vendors and have sent inquiries to others and I am only to number 200 on the list!!! Really appreciate the great shopping tips! Ooo... this is a good topic! I'm looking forward to scrolling through all the sites & finding unique things! Also, just so you know, you have a little typo in your title. It says "Show Us How Your Life" instead of "Live"... no big deal, but just thought I'd let ya know! Thank you so much for doing this! I already have an order from one of your readers! With all of Brody's surgeries we were really wondering if we were going to be able to afford his Christmas. But this is a great start to saving up for him. Thanks again!!! Thanks So Much! I can't wait to visit these links for Christmas gifts...Perfect Timing! i don't make anything but this was a GREAT idea for SUYL Friday!!!! LOVE IT! can't wait to shop! it's like junior league's holiday mart on your website! I thought I saw on here someone who made capes. If so, please contact me: dawniele@orbitelcom.com with your web link. So I'm a little behind on your blog because my son was born last Thursday. But I have a business that I wanted to share as well...www.deesignsbyerin.com. I paint furniture and birthday banners, make tutus, and much more. My prices are reasonable because I want you to be able to enjoy the fun things in life without being broke! Ladies, you all are so talented!!! I wanted to invite you to join me in a fundraiser for Laurren Smith. She is an 8th grader who is battling a rare form of cancer. I created a Shop in Your PJs for Laurren blog so if you would like to join me over there, it would be greatly appreciated! http://www.shopinyourpjsforlaurren.blogspot.com and yes, I do have the support and approval from her father Brian! It is his heart's desire that Laurren's Story gets told and shared with as many people as possible to pray for his daughter!